Mars II : what do we understand ? How much do we understand ? Mars is certainly a special planet. Although only half the size of the Earth, it is home to some of the largest geological features in the Solar System, including volcanoes and valleys. 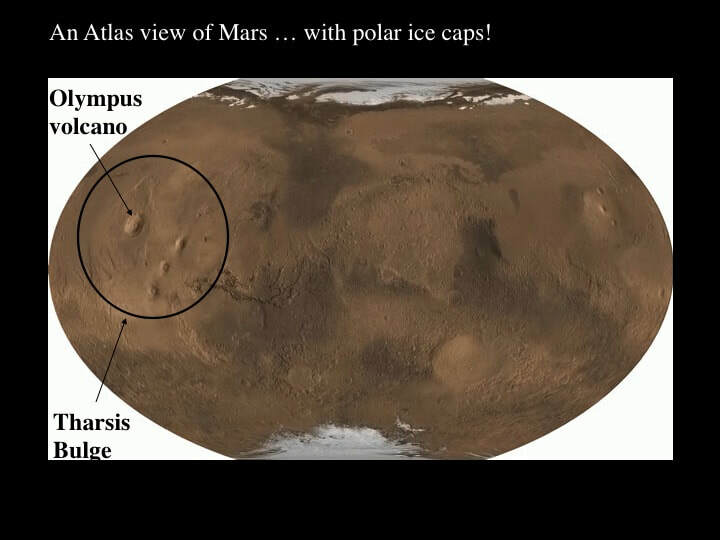 Here we'll look at 3 important features of the martian surface : Tharsis, the Mariner Valley, and permafrost as reflected by impact features. ​Let’s start with the volcanoes associated with the Tharsis Bulge, including Olympus, the largest volcano or mountain anywhere in the Solar System (25-27 km high, compared with less than 10 km for Everest). The Tharsis Bulge is a large plateau highland. Because of the distribution of impact craters that affect the lavas that erupted from the volcanoes, we know that the Tharsis Bulge has been the site of active volcanism for a very long time. The oldest volcanic eruptions, peppered with impact craters, are up to 3.8 billion years old, while the very youngest show no impacts at all, and may be as young as 25 million years old. ​Think about this for a minute; we’re talking here about a huge highland region, with some of the largest volcanoes known in the Solar System, that have continued to erupt for billions of years, not just in the same place, but in one location on the entire planet! Just how do you do that? One thing we can be sure of is that there’s nothing like it on Earth ! Volcanoes here are scattered all over the planet, and erupt for a few million years at the very most. This is because they are generated by plate tectonics in dynamic environments that are constantly changing. In contrast, the Tharsis volcanoes require a situation that has remained more or less constant for billions of years. 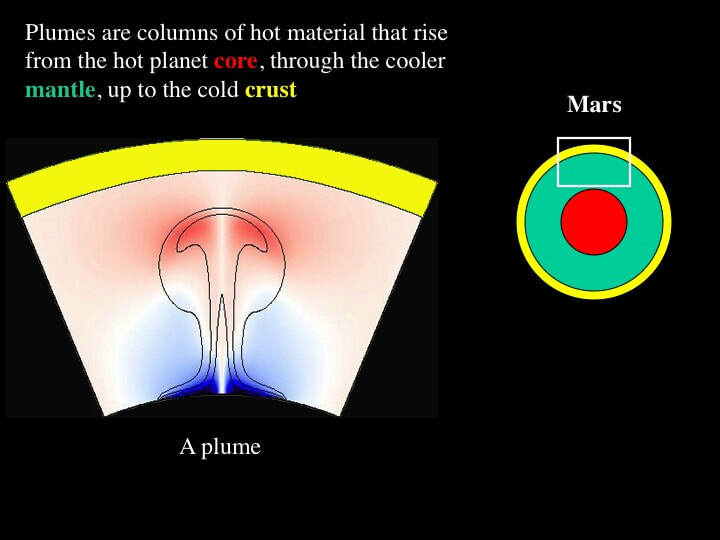 Some planetary geologists suggest that the location of the Tharsis volcanoes, including Olympus, indicates that Martian volcanism is not controlled by plate tectonics as on Earth, but by huge plumes of hot material that rise inside the planet from its core. 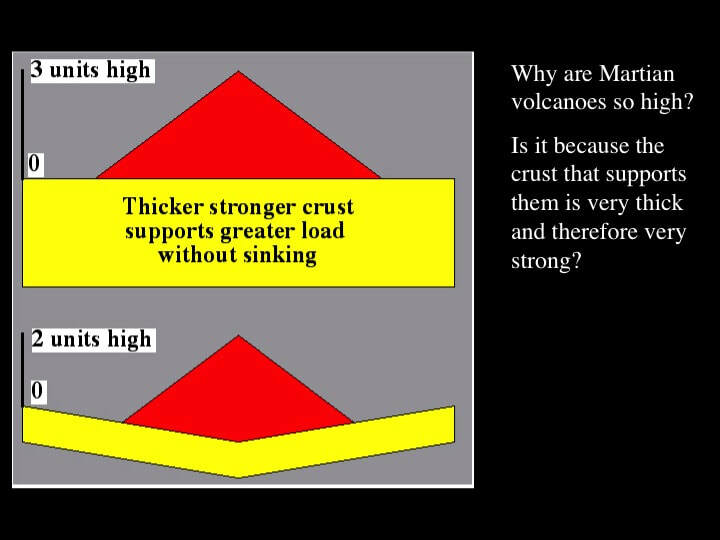 This could also explain the great height of the Tharsis volcanoes, because they would be sitting on a bulge held up by the same rising plume that brought the hot lava to the surface in the first place. At first blush, this sounds reasonable, until we start asking questions: Why is there only one major volcanic centre ? Does this mean there’s only one plume in the entire history of Mars ? How does that plume of hot material keep on rising for billions of years ? Earth has plumes too, but there are lots of them at any given time in geological history; they die off with time and are replaced by others in different places. Maybe the single plume model isn’t such a good explanation after all. So, what are the alternatives ? Other planetary geologists wonder if the interior of Mars had lots of smaller plumes scattered all over the place just like the Earth, and have suggested that the Tharsis bulge is the one place on Mars where the crust is thinner than anywhere else on the planet. They explain the billions of years of volcanism as the result of a local defect in an otherwise normal planet. This sounds OK, until we ask why the volcanoes associated with the Tharsis bulge are so high ? For some the answer is pretty simple. 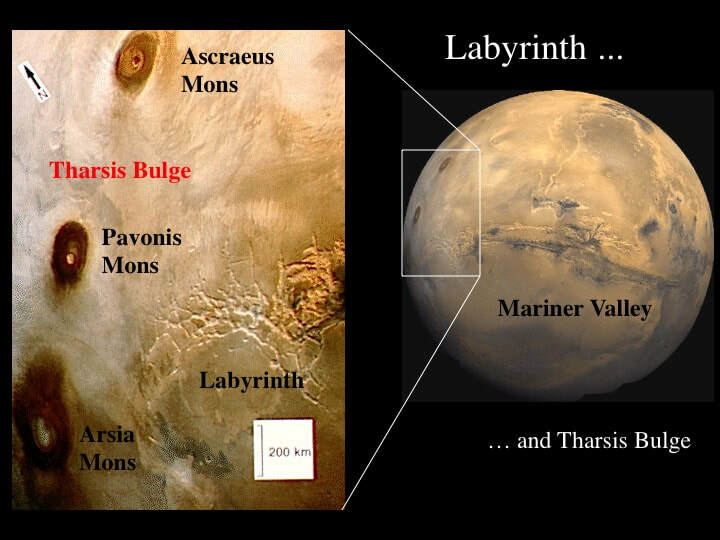 The Tharsis bulge with its gigantic volcanoes represents a huge load sitting on the planetary surface without sinking; therefore the Martian crust must be extremely strong in order to support it (top). 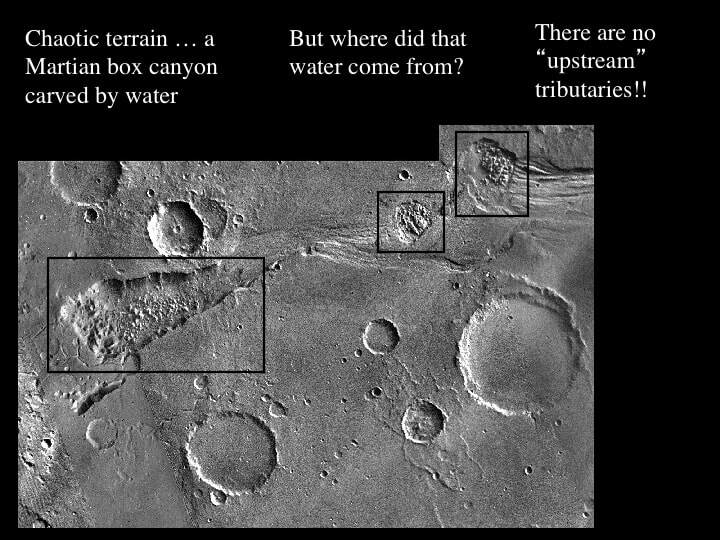 Geologically, that means that the crust must be extremely thick in order to be so strong, but this is just the opposite of the “thin-crust” hypothesis that interprets Tharsis and Olympus as a leak through a local patch of thin Martian crust (bottom). What we’ve just examined is the greatest puzzle faced by planetary geologists studying Mars. None of these explanations seem to work, and some of them contradict others. The bottom line is that these huge, high, extremely long-lived volcanoes that occur in one spot on an entire planet are one of the great enigmas of the Solar System. We simply don’t know how to explain them yet ! Let’s turn to something that should be easier to explain: the Mariner Valley, the largest valley in the Solar System. The main central segment of the Mariner Valley is often referred to as a “rift valley”. There are few geological features simpler than a rift valley, so this should be pretty straight-forward to explain; maybe ! To pull the sides of a big rift valley you have make room for the expansion. Either the circumference of the planet has to increase, or something has to sink into the planet as plates move around, or something has to get crumpled-up, such as when a mountain chain forms. 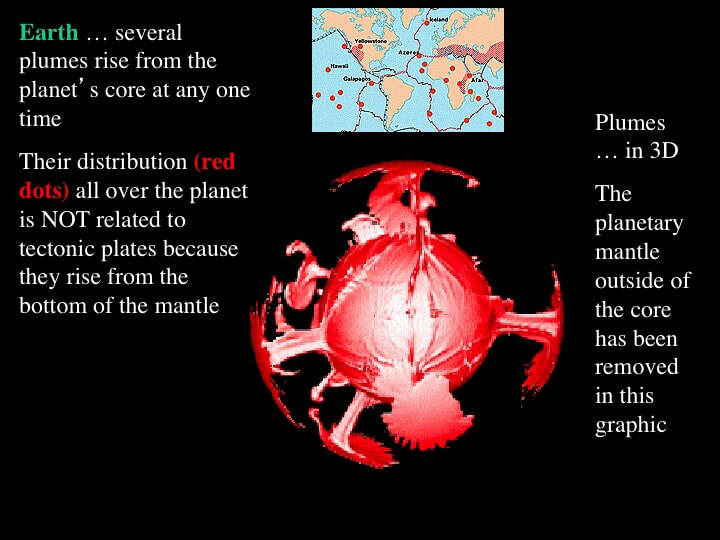 Well, geologists don’t believe that planets expand, Mars shows no sign of ever having had plates that moved around, and martian mountains are volcanic rather than the result of crumpling. So just how did the central part of the Mariner Valley form ? It probably started out as a network of fracture-controlled narrow valleys that didn’t require much crustal extension to form initially, and then grew to its present size by erosion; but erosion by what ? No prizes for guessing “water”, but as in all things martian, it’s not quite as simple as it looks at first glance (see below). Mariner Valley is divided into 3 segments, from the Labyrinth in the west to the Chaotic Terrain in the east. The Labyrinth looks like crazy paving developed on the east side of the Tharsis Bulge, or like the crust of a loaf of bread that has risen a bit too high and a bit too fast. 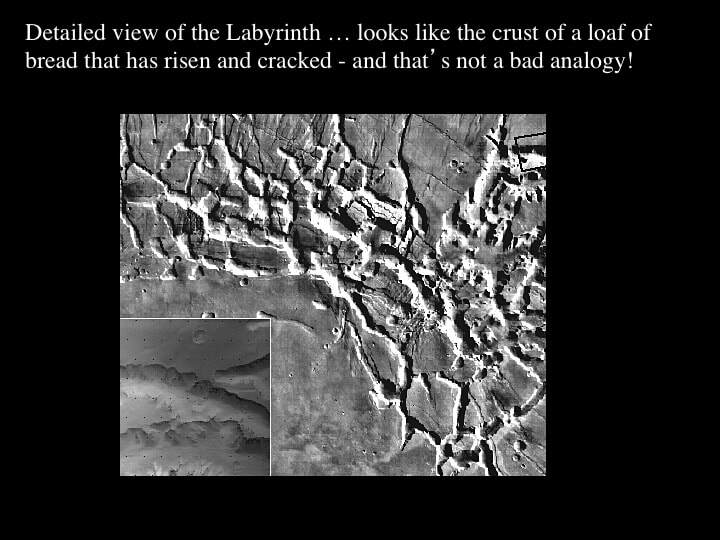 That’s not a bad analogy because it formed when the Tharsis bulge rose too quickly for the Martian crust to stretch without breaking, so it formed a linked network of angular canyons. Of course we still don’t know why the Tharsis bulge rose in the first place, but that’s part of the mystery. The main clues about erosion and the formation of the Mariner Valley are to be found in the lower reaches at the east end , in what’s called the “Chaotic Terrain”. 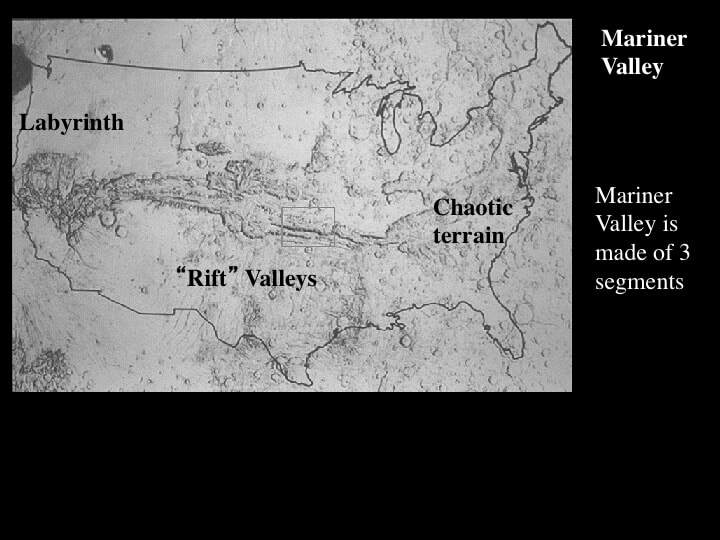 This is essentially a set of valleys with rubbly floors interpreted by planetary geologists as the result of collapse of the surface rocks into what is now the valley floor. The upper reaches of the valleys are like box canyons with very steep sides. The other striking feature is the absence of tributaries feeding into the valleys. This is very important because it means that whatever carved out the valleys downstream, perhaps flowing surface water, suddenly appeared at the surface in the box canyon itself. 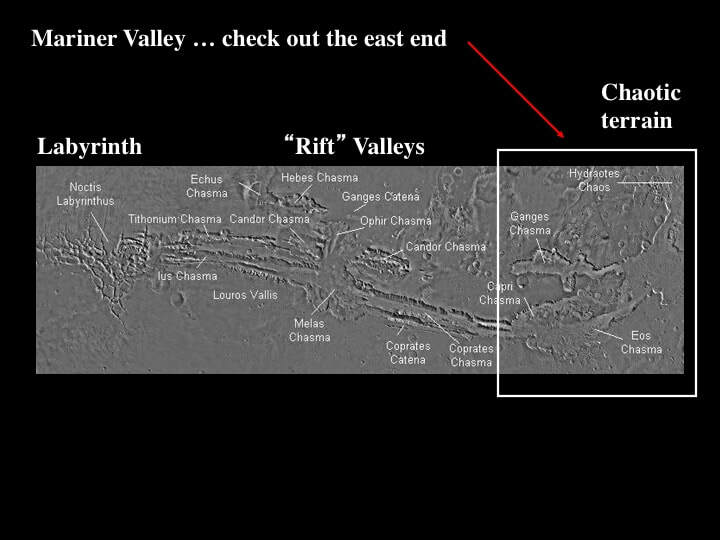 In other words, these are not a typical river valleys such as you would find here on Earth. This has led some planetary geologists to suggest that Chaotic Terrain formed when permafrost, or permanently frozen groundwater just below the surface, melted and gave rise to short-lived, probably catastrophic flash-floods that went on to carve out the rest of the valley further downstream. In doing so, they carried away a significant volume of the material at the head of the valley, creating holes into which the remaining material collapsed to form the box canyon, giving rise to chaotic rubble on the valley floor - hence the name “Chaotic Terrain”. Now imagine this same phenomenon occurring within the initial, fracture-controlled narrow valleys in the central part of the Mariner Valley. 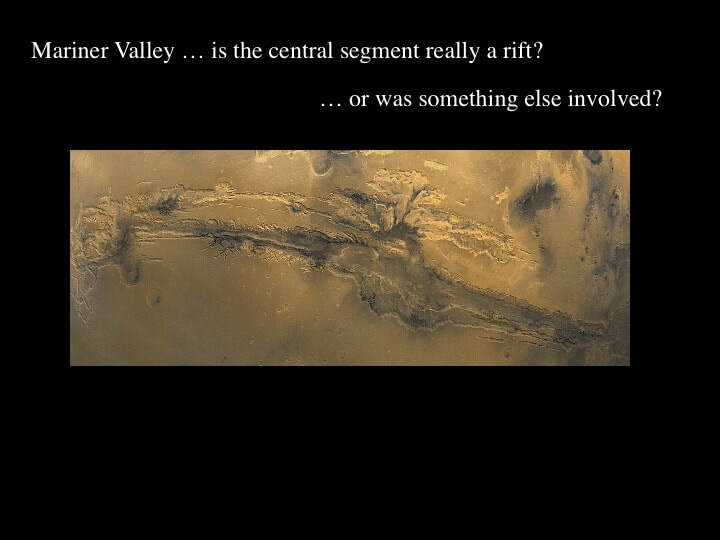 Such flash floods would be capable of creating the huge, long canyons that make up so much of the Mariner Valley, but without extensive rifting. What independent evidence is there for permafrost on Mars ? Impact craters on the Moon or Mercury are sharply bounded, but many Martian impact craters are surrounded by broad lobes of material that radiate out from the crater centre. The lobes look just like the splash from a stone dropped into a puddle of mud from a great height. 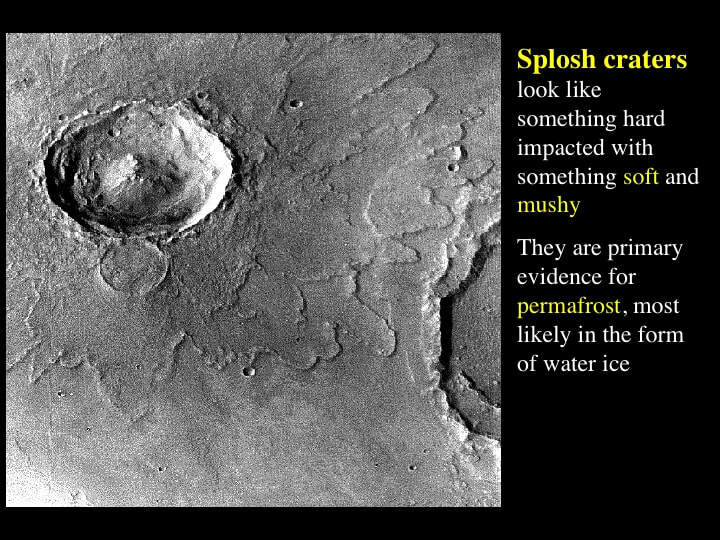 Hence, many planetary geologists think that they reflect meteorite impacts into permafrost terrain that instantly melted to form water mixed with rock (mud) that splashed out radially around the crater; hence the term “Splosh Craters”. 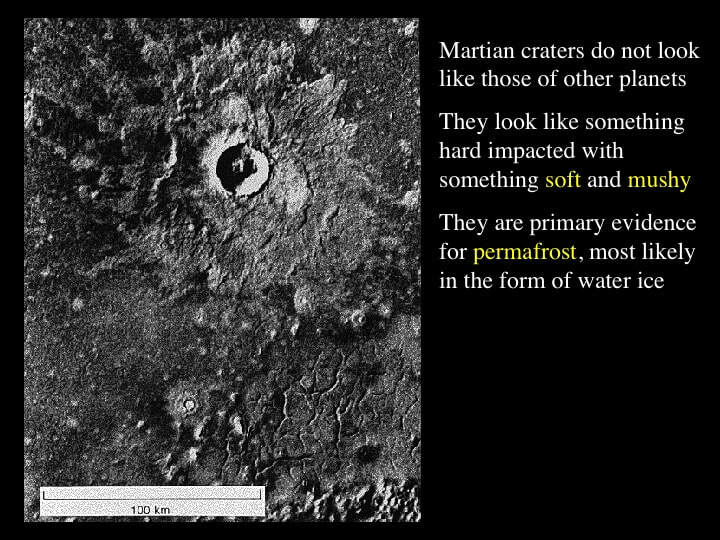 These craters provide the primary evidence for permafrost on Mars. My take-home message here is that planetary geologists are still struggling to explain the fascinating bedrock geology of Mars. Geologically, Mars is a frontier region about which we still know so little ... and understand even less.